LOS ANGELES (AP) With three wins in four stops on a leisurely paced road trip, the Charlotte Hornets unexpectedly hit their stride in California. The Los Angeles Lakers are still stumbling around. Kemba Walker had 19 points and seven assists, and the Hornets wrapped up a solid trip with their first back-to-back victories since Thanksgiving, beating the spiraling Lakers 108-94 on Friday night. Jeremy Lamb scored 17 points and Marvin Williams added 16 for the Hornets, who won three of four in the Golden State, including a shocking win over the Warriors to kick off the trip. The Hornets wrapped up the road swing by emphatically avenging their home loss to the Lakers last month. Six players scored in double figures for Charlotte, which has won four of six overall. Dwight Howard had 15 points and 10 rebounds while the Hornets had little trouble staying ahead of the Lakers after the opening minutes. Charlotte took a 16-point lead in the first half and stretched it to 21 in the third quarter. Lonzo Ball had 11 points and five assists in his first game since Dec. 23 for the Lakers, who have lost nine straight since Dec. 20. The rookie point guard missed six games with a sprained left shoulder, and he returned in limited minutes while rebuilding his strength. The Lakers’ faithful fans are even growing frustrated in what looks like a fifth consecutive losing season. They booed the Lakers after Lamb’s uncontested alley-oop dunk on a fast break put the Hornets up by 25 early in the fourth quarter. 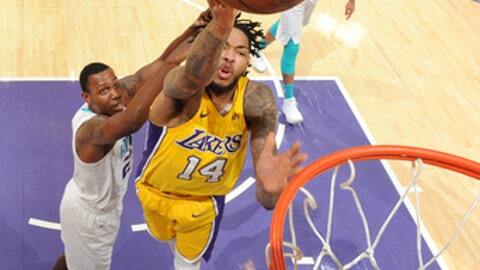 Ingram had 22 points and a career-high 14 rebounds, but Los Angeles dropped to 1-12 since winning at Charlotte on Dec. 9. The Lakers (11-27) are in last place in the Western Conference. Hornets: Frank Kaminsky scored 12 points. He also got a technical foul in the fourth quarter for arguing a call. … Michael Kidd-Gilchrist added 13 points and eight rebounds. Lakers: Brook Lopez scored 11 points in his second game back from an eight-game absence with a sprained ankle. … Jennifer Lopez and Alex Rodriguez watched the game at courtside, as did comedian John Mulaney. The Lakers are the NBA’s worst 3-point shooting team, and they went 9 for 36 against the Hornets. At least they improved the NBA’s worst free-throw shooting percentage by going 9 for 12. Hornets: Host the Dallas Mavericks on Wednesday in their first home game of 2018. Lakers: Host the Atlanta Hawks on Sunday night in a meeting of the NBA’s two worst teams.